The sharp decline in Steller’s eider population and the near disappearance of this species from the Yukon-Kuskokwim Delta, once the most populated breeding ground in Alaska, stimulated the listing of Alaska-breeding Steller's eiders as a threatened species under the Endangered Species Act in 1997. Critical habitat for this species was designated in 2001. 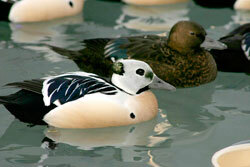 For general information on Steller's Eider, see the Steller's Eider species profile page.